Battle of Vertières Day is a public holiday in Haiti. It's annually celebrated on November 18 to commemorate the victory of the Battle of Vertières in the Second War of Haitian Independence in 1803. The Battle of Vertières was the major battle between the Haitian rebels and the French occupants. 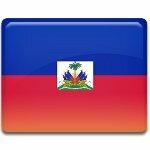 Just two months after the end of the battle Haiti gained independence from France, becoming the first black independent republic. Battle of Vertières Day was also known as Army Day or Armed Forces Day. Celebration included a grand military parade, that was a main event. In the early 1990s President of Haiti Jean-Bertrand Aristide abolished the Haitian Armed Forces, because it was notorious for its brutality. Consequently, celebration of Battle of Vertières Day lacked the parade, that was substituted with other public ceremonies. President of Haiti annually delivers a solemn speech at the monument site in the capital of Haiti, Port-au-Prince on this day. People also participate in other public ceremonies, that are held throughout the country.